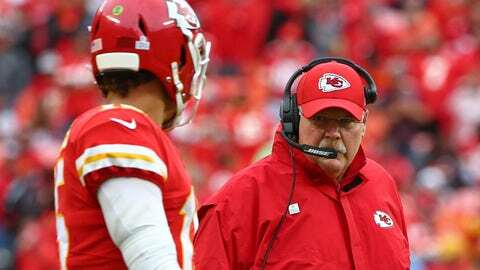 There seems to be no end to what Andy Reid can think of to do with Patrick Mahomes and the Kansas City offense. KANSAS CITY, Mo. — The Kansas City Chiefs break huddle and line up in a traditional formation: Patrick Mahomes settles under center, Kareem Hunt is in the backfield, tight end Travis Kelce joins wide receiver Sammy Watkins on the right side, and Tyreek Hill and Demarcus Robinson head to the left. Then, from a defensive perspective, all hell breaks loose. Mahomes is suddenly dropping into the shotgun, careful he doesn’t run into Hunt, who has moved from the left side to the right. Hill has run all the way across the field and lined up on the right, just as Kelce has raced in the other direction to line up on the left. The defense thought it had everyone covered. Now, mismatches abound as linebackers try to cover Kelce and safeties are forced to match up with the Chiefs’ speedy wide receivers. That play against Pittsburgh a couple of weeks ago wasn’t just a gimmick. That’s standard stuff in the Chiefs’ basic offense, a seemingly seamless melding of Andy Reid’s old-school West Coast system and the new-school spread offenses that have changed the college game. “That play calling was something I’ve never seen before,” said Jacksonville safety Tashaun Gipson, whose top-ranked defense was torched in a 30-14 loss at Arrowhead Stadium last Sunday. They’ve had their way with just about everybody the first five weeks, piling up a franchise-record 175 points. Mahomes has already thrown for 1,513 yards, shattering the Chiefs’ mark for five games, and a 300-yard passing game at New England on Sunday would give him a team-record five straight. Kansas City (5-0) has scored at least 30 points in each of its games. What the Chiefs are doing this season is hardly a flash-in-the-pan attack, though. It’s the culmination of years of tinkering, beginning with Brad Childress’ work as “spread game analyst” and incorporating bits of the college-style spread attack to what the Chiefs were doing last season. But while Alex Smith could pull off run-pass options, or do things in the quarterback-run game, it wasn’t a perfect fit. That came when Mahomes took over as the starter this season. Mahomes is a product of the Air Raid system, basically a spread offense on steroids. He is accustomed to a flood of targets all over the field, quickly identifying where the matchup problems give the offense an advantage, and delivering the ball so that his playmakers can make things happen. Plus, Mahomes has the arm strength to make any throw. Most of the time, though, the Chiefs are able to give him garage doors. That’s because they have the personnel to make all those creative formations work. Kelce is athletic enough to line up anywhere on the field, Hunt has excellent hands for a running back, and Hill and Watkins have the speed to beat anyone in a one-on-one matchup. So, for example, the Chiefs can line up without anyone in the backfield, forcing defenses to change their personnel and alignment. Then the motion games begin, and Kelce or Hill or someone else could end up in the backfield, creating confusion and mismatches. Or downright impossible, it sometimes seems. Shanahan said the foundation remains the West Coast offense, and the Chiefs are still capable of beating teams with basic stuff. Just look at how they’ve put away games late in the fourth quarter, when they’ve leaned on Hunt and some old-fashioned, smash-mouth football. But none of that catches people’s attention like the flashy stuff. NOTES: SS Eric Berry (heel), FS Eric Murray (ankle) and OLBs Justin Houston (hamstring) and Tanoh Kpassagnon (ankle) remained out of practice Thursday. RB Spencer Ware was out for a personal matter.